It's only a few days until Valentine's Day, but don't worry: each of these gifts for your beloved bookworm is under $20 and most can be ordered for speedy delivery. Don't resort to getting your significant other just flowers or chocolate, get them something special related to their favorite hobby (but get them the flowers and chocolate too, because CHOCOLATE!). If you're flying solo this year, then get yourself all the things. Treat yo' self! 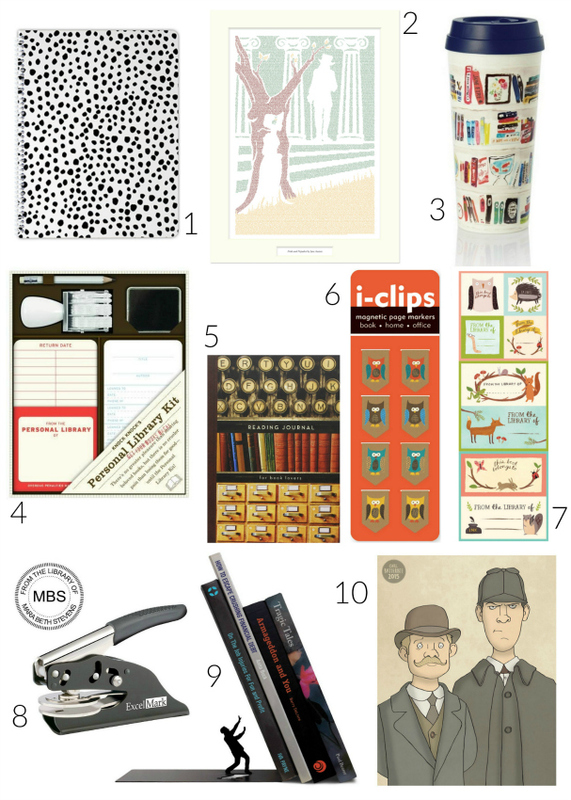 Here's a list of ten last-minute but totally spot-on and affordable gift ideas to check out. (1) Dotty spiral notebook ($14). My friend Shannon over at Plum Street Prints knocks it out of the park with her beautiful hand-painted designs for notebooks, journals, phone cases, and more. I love this fun 50-page notebook perfect for jotting down ideas or keeping track of your to-do lists. (2) Pride and Prejudice 12"x16" matted text poster ($19). Litographs makes posters, totes, and t-shirts with designs created from the text of beloved novels. I've ordered a number of these before and given them as gifts. They have designs for Peter Pan, Alice's Adventures in Wonderland, and so many more. (3) Thermal mug with bookshelf design ($18). This Kate Spade insulated thermal mug is great for sipping a warm drink while reading your favorite book. Bonus: the mug is BPA, lead, and phthalate free. (4) Personal library kit ($11.90). The Knock Knock library kit is designed to help you keep track of your books, particularly if you're a frequent lender to your friends. (5) Reading journal ($6.49). If you're not on the Goodreads app (and if you are, follow me at http://goodreads.com/jactionary) or if you like keeping handwritten records as well, check out this very affordable 160-page reading journal for keeping track of your book reviews. (6) Magnetic owl page-marker clips ($2.07). I didn't get my first magnetic page-marker (aka bookmarker) until I was in graduate school. I absolutely loved it and use it all the time. I like these cute owl designs from i-Clip as well as their woodland friends set. Each package comes with a set of eight so you can share them with others or if you're like me and can't help reading more than a handful of books at once, they've got you covered. (7) Forest friends book plates ($4.62). Speaking of animal friends, these bookplates are really bright and fun. The come in packages of 80, so if you own way too many books you'll appreciate the low price so you can purchase them in bulk. (8) Customized book embosser ($19.95). This is all the things: a customized book embosser for imprinting the first page of your books with your name or company. I love it so much. At less than $20 it's a steal ant you can specialize the imprint before giving it away as a gift. (9) Dramatic bookend ($14.71). I adore silhouettes (thus why I've dedicated an entire Pinterest board to the subject--oh, and I've got one just for bookends too). This Fred & Friends bookend caught my eye pretty quickly. It's a clever way to stack some of your most chilling reads on your bookshelf. If you're a teacher and feeling overwhelmed by stacks and stacks of grading, this would be a humorous addition to your work space. (10) Sherlock and Watson illustration ($14.87). I've written before about Carl Batterbee's illustrations when I ordered three custom literary prints for my office (I chose Harry Potter and Agatha Christie designs). This Sherlock and Watson illustration is great as are so many of his other literary designs. PERSONAL LIBRARY KIT!!! ALL the heart eyes! !